Whether it’s at a bar or in the comfort of your very own man cave, dart throwing is a great game to play with some friends. 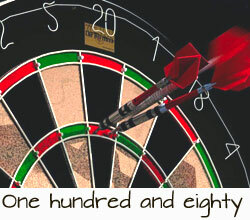 While most see it as a casual game, many guys take a game of darts seriously. Accurately throwing a dart requires skill and dexterity. While it may seem difficult at first, a bit of practice and knowledge will have you throwing darts like a pro in no time. The first thing you’ll want to master is your stance. The way you stand and the position of your body can have an immense impact on the trajectory of the dart. Much like other sports, your stance is the foundation of a good throw. There are a few different ways you can position your feet. However, successful players generally position their feet and body sideways. 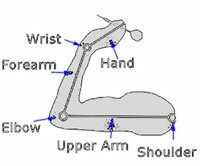 This helps to improve your accuracy by preventing movement of your elbow. The actual placement of your feet in relation to your body is important. The feet should be shoulder width apart with your dominant foot in front. You should put most of your weight on your dominant foot to gain some stability and use your other foot to keep balance. When it comes to your upper body, it is important to keep as still as possible. That being said, it’s also important to be comfortable. Generally, your shoulders should be as straight as possible. You should also fight the urge to lean. Leaning will only throw off your balance and affect your throw. With a controlled upper body, you prevent side movements. Having a proper grasp on your dart can also have an effect on where the dart goes. There are many ways to hold the dart. Some techniques work for some while feeling uncomfortable to others. Essentially, you should hold the dart in a way that feels comfortable and natural to you. 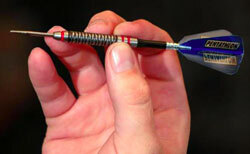 You should use at least three fingers to hold the dart with every finger touching only the barrel or the tip. The number of fingers you use should be based on comfort and the length of the barrel. Once you’ve found a pleasant grip, you can fine tune it to make it effective. It’s important to keep the tip of the dart up as you throw. You should maintain the upward position throughout the entire throw. This prevents the dart from rotating down too much before it hits the board. 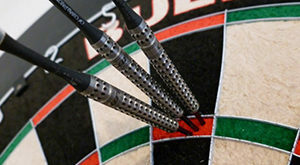 You should hold the dart with enough pressure to keep it steady as you throw, but light enough to release the dart without affecting its trajectory. 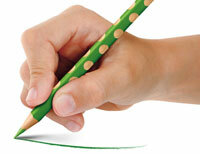 * The amount of pressure should feel comfortable and natural, much like holding a pencil. Now that you’ve got the stance and grip down, it is time to take aim. This is where the skill comes in. Aiming is a crucial part of the throw. 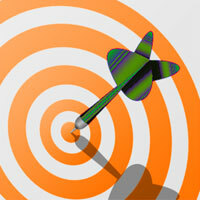 It may take time to get the hang of it, but eventually, you’ll be able to aim quickly and take your shot. There are a few different methods to aiming. However, there are a few things to keep in mind to make your throw successful. Because it will be a big part of the actual throw, you should use your elbow to establish a general aiming line. This will position your throwing arm correctly and stabilize your aim. Your elbow should be pointing directly at the board and slightly upwards. It may seem uncomfortable at first, so you can slowly build up your elbow position with time. Now you can find a point on the board that you want to hit and create a sight line. You should always use your dominant eye. By keeping your other eye closed, you can focus solely on your target. You can use whatever is most comfortable to create a direct line to the target. Commonly, the tip of the dart is used. However, a knuckle or part of your finger can also be used. The key is to use something that you will continue to use and create a direct line of sight. Once you have mastered everything else, you must learn to properly throw the dart. 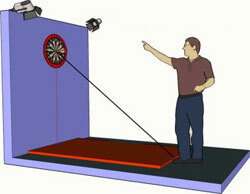 To make an accurate throw, you need to understand the motions of the dart during a throw. Darts move along a parabolic curve. They accelerate and rise, then dip along a curve. This curve is why we keep the tip of the dart pointed up. To make the most out of the throw, your arm should move in this same motion. The main mechanics of your arm act as a lever. The elbow and wrist act as the pivot, with the shoulder remaining stationary. You should keep your body and elbow still as you pull your forearm back. As you move your forearm forward to accelerate, your elbow should move up slightly to create that effective curve. For even more accuracy, you can flick your wrist slightly before you release the dart. This will cause it to accelerate even further, improving your overall aim. If done correctly, the throw will allow the dart to move along the parabolic curve naturally, sticking to your desired target. After the throw, it is important to follow through with the throw instead of immediately relaxing. If you relax too soon, you could affect the trajectory of the dart. Your arm should continue in the throwing motion and stop where you were aiming. It’s important to keep consistent. It may seem like your throws are off at first. Even if they are, stick with the techniques and don’t compensate. The repetition and consistency will improve your throws drastically. With these tips and techniques in mind, you can continue to improve your throws. Before long, you’ll be a local dart champion that can beat any competitor.